Pathfinder is the system of choice for any experienced data analyst. With Pathfinder, you gain insight into the behavior of your visitors and customers on your websites and fully-automated receive targeted recommendations for the further success of your digital sales campaigns. Discover how visitors and customers surf your website. The visualization makes it easy to deduce optimizations for lower bounce rates and higher conversion rates through better user experience. How do your customers reach their goals? Find the most important paths, but also weak points of the customer journey. Benefit from live analyses of all data in real time. Connect your CRM data pool for an even deeper analysis. 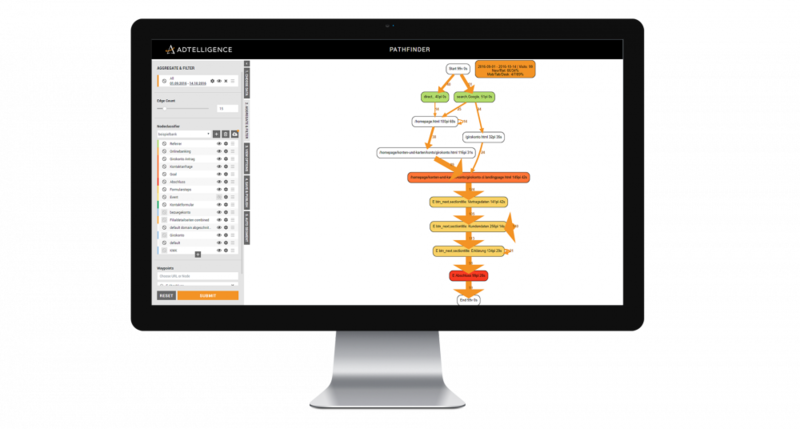 You control your analysis and zoom from high-level overviews down to individual user journeys. Track the main paths across your entire page or zoom into specific sections of your website. Understand where your visitors drop off your registration forms. Automatic segmentation of customer data allows you to create customer groups with similar behavior or needs. Similar user behavior is automatically calculated using machine learning methods. Similar behavior patterns of customers can be compared in detail. We, as Sales Team, have the task to inform you in the best possible way about the application possibilities of our products and solutions. We advise you individually and personally. Please do not hesitate to contact us. We are there for you.